It was nighttime in the last week of March 1970 when I first heard Wanted Man. Pain had become a constant companion. My legs were on fire. I was in traction, laying flat on my back at a slight angle, with my feet elevated. The weights hanging at the foot of the bed were supposed to be adjusting my hip sockets in preparation for surgery. The left hip was broken; the right hip had issues that’d require it to be pinned for a period of time. Both legs were wrapped in heavy adhesive tape that was causing an inflammation. The skin was extremely itchy, crawling with prickly tentacles. The darkness of the night was conjuring lonesome feelings. I was sequestered in a two-bed cell, unable to sleep. The curtain between the beds was closed. A radio—tuned to 1470 CHOW—was on the pillow pressed up against an ear. CHOW had a country format, with some rock sprinkled in from time to time. The midnight to six disc jockey had a bit of an edge, and I was soaking in an education. He teased the next song, saying something about Johnny Cash and Bob Dylan, and then went to an advertising jingle. My ears pricked up in anticipation. The previous summer and fall, as a thirteen year old who’d recently acquired a nasty limp, I’d discovered Big John Cash and Bob Dylan for myself. I didn’t know it then, but Cash and Dylan were destined to become entrenched in my life. There have been times when their words and music spoke to me in ways that were surreal. My most intense spiritual insights have often come while listening to one or the other of them. That night at the Welland County General Hospital, the disc jockey returned from commercial and said two words twice: “Wanted Man, Wanted Man.” The strains of a raw sounding guitar filled my ears and took me faraway. For a few moments the stabbing pain across my hips was gone; the insidious itching racing up and down my legs was silenced. The isolation and sense of loss got smothered by a three-minute record; fear of the future was swallowed whole. I was no longer trapped in a bed with railings or stuck inside of pain. The hospital room faded away into nothingness. I was out on the open road with Big John Cash, getting chased down by a posse or some such thing. California, Buffalo, Kansas City, Ohio, Mississippi, Cheyenne—these were the first stops on the journey. A latent wanderlust was alive and well in me, ignited by that singularly robust baritone voice singing a story that hinted at danger. We headed to Colorado, and then Georgia. I heard about being a wanted man by Lucy Watson, Jeannie Brown, and Nellie Johnson. Snapshot reflections of Bonnie, Judy, and Sylvia flickered through my mind. Being fourteen years old—broken hip or no broken hip—wild hormones were a hopping. Bonnie, Judy, Sylvia—classmates with pretty eyes and budding curves had each engaged in innocent flirtations with me, which was enough to jack the blood temperature up a few degrees. Cash brought me back to the road trip. We got sidetracked in El Paso. A wrong turn was made in Juarez due to distractions caused by Juanita. Then it was on to Shreveport and Abilene. Albuquerque, Syracuse, Tallahassee, and Baton Rouge all got lost in the rearview mirror. My eyes were closed. Imagination sketched outlines of these exotic sounding places, all of which, with the exception of Buffalo, I’d never visited. When the song ended, I clicked the radio off and replayed the lyrics over in my head. That was the only instance during my six-month incarceration that I heard the song, but it was enough; it burned itself into my psyche. Mostly I kept it to myself; a jewel on the private juke-box in my mind. It always speaks to me about wandering, brokenness, sin, and redemption, a.k.a. the stuff of life. It was a get-together at Johnny and June’s house in Nashville. The air must’ve been electric with creative energy—it evidently became a force that couldn’t be stopped or even slowed down. 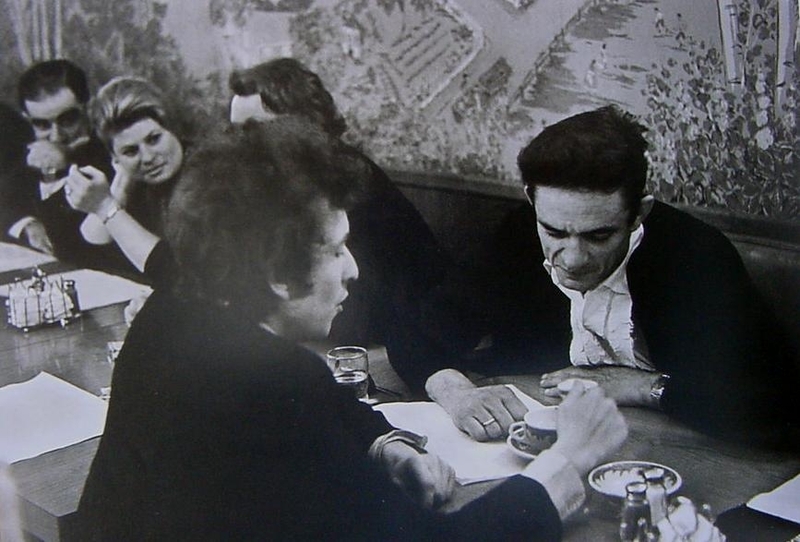 Cash’s Songs That Made A Difference was written about that night. Dylan mentions the celebrated gathering in his book Chronicles, Volume One. We can surmise that it was a mid-February night. At San Quentin was recorded on February 24, 1969—on it Cash introduces Wanted Man by saying that “last week in Nashville, Bob Dylan. . .” Also, at that San Quentin concert, Cash performed A Boy Named Sue for the first time, cracking wise about being anxious to hear how it’d sound. A Boy Named Sue was written by Shel Silverstein. Shel is mentioned in the first verse of Songs That Made A Difference. My best investigative guess is that Silverstein introduced Cash to A Boy Named Sue during the course of that storied evening. What other musical diamonds were presented or polished in that circle? Did Cash and Dylan sit off in the corner and compose Wanted Man? Was it the wee-hours of the morning? Had the party broken up? Had the house emptied out, leaving the two legends alone? Was Dylan an overnight guest? Was it the next day that they lined out the rhythm and rhymes? The answers to those questions are all unknown to me. 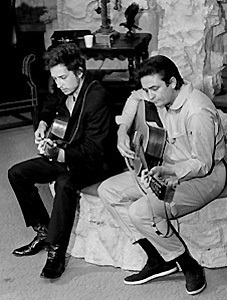 Whatever the circumstance, when Cash and Dylan got together to share their craft, the result was a song for the ages. Fast forward more years and miles than I can enumerate. Anita and I were traveling across Ohio with our granddaughters in the backseat. Zoe Grace was eleven years old, Jessica Noel eight. At San Quentin was on the CD player. Driving along familiar roads a part of my brain crawled into the music. It mattered not that each song was well known to me. At every new listening there’s a memory or story unleashed that keeps me focused on it. “Grandpa,” Zoe said, breaking into my daydream. “What one?” I asked, blanking out. “Yeah, play it again,” Jessica piped up, giggling a bit. “I want to count the places we’ve been together,” Jessica replied, grinning wide. “Me too,” Zoe said with a nod. I replayed it. And then again. The four of us laughed. We hadn’t been to all those places yet, but several of them and one never knows where the road will lead because while we’re still breathing, it really does go on forever. The song Wanted Man made a difference in my life. It was a companion during a crooked piece of time when trauma was shaping me, changing me. It has popped up here and there along the way, always touching me in ways that are deeply personal and impossible to define or explain. Age, years, miles, heartaches, and far too many forced goodbyes have all taken their chisel to my soul and perspective. The package deal of life has the good, bad, and ugly for everyone, and no one escapes alive. Wanted Man still gets plenty of airplay in my life. Ultimately it reminds me that I am a wanted man—that we’re all wanted men and women—who are being tracked down by that grim-faced outlaw whose sole motivation is to steal, kill, and destroy. Death is trailing us. What do we do with that ever-present reality? For me, it means that I seek to live significantly, driven by a desire to leave footsteps for others to learn from—to speak and write words that make a difference. In conclusion, this tab will be a collection of stories and articles featuring the music of Big John Cash or Bob Dylan, the bard of Hibbing, MN.